Online ordering is a really important part of the revenue mix for some restaurants. This is the first part of a two-part podcast on the economics of online ordering and how small restaurants are dramatically increasing profitability with a few simple tweaks. Menulog, Just Eat, Grub Hub and Delivery Hero are charging 13% commission and not giving the restaurants the email addresses, so it is very difficult to build a sustainable take out business with those platforms. We look at why restaurants do take-out. Often, the bottleneck for a restaurant is the number of tables in a restaurant and the number of times you turn those tables. Take-out moves spare capacity in your kitchen past the bottleneck of the tables that you have, allowing for significantly higher revenue if you have a big mismatch between kitchen capability and in-house consumption. What problem do you solve with in your restaurant? Take out offers convenience, the ability to have a few drinks without worrying about an Uber home. For us, take out allows us to Netflix and Chill, rather than the issues associated with going out. It offers flexibility and convenience, and it dramatically opens up your target market when you offer take out. One of the big things that Uber has done is that they have increased the calibre of restaurants that are now offering take out, with customers now increasing the amount of take out that they are eating, which goes hand in hand with the increasing number of customers who are time poor. What are the problems with Take Out? For delivery, the synchronisation of getting meals out of the kitchen becomes a lot more complicated because rather than relying on front of house to get the meal to the table, now a delivery driver needs to be organised and synchronised with the food coming out of the kitchen to get it to the customer in a reasonable time. Using UberEATS removes some of the logistics issues, but it also means that you are losing 35% of revenue as well as not getting the customers email address. We look at some of the statistics around Online Orders. We discuss the average order value and anecdotally, Thai has a lower average order value than Indian. The spread of the number of orders that a restaurant takes is incredible. Some restaurants take 1 order a week. Some are doing $2,000 – $3,000 a week! This means that some restaurants have an extra $150,000 a year in revenue. If they are using a delivery service that charges, they may be paying $20,000 a year in commission and NOT getting any of their customers email addresses. We have some restaurants saving over $1,000 a month in commissions using the Free Restaurant OnLine Ordering system. What is the product that you offer through take out? Often the menu is exactly the same as the dine-in menu without any thought to the issues with delivery. How is it packaged? What can you do to make a better experience for your customers when they unpack their food. What branding do you do for your restaurant? Do you have online ordering online specials? We look at how Qantas uses online only specials to drive passengers to pre-order their meals. It makes it easier for them to cater for everyone. They offer online only special meals, which are using pretty epic – this drives people to pre order, meaning they have a much better idea of the number of meals that they will need for each flight. Remember, they can’t just go out to the supermarket and pick up a couple of extra steaks when they are at 30,000 feet. How are you driving phone orders? Companies like Menulog, Just Eat and Delivery Hero will not publish your phone number because they don’t want any phone orders because they don’t make any commission on it, but there are still a lot of people who want to order over the phone. 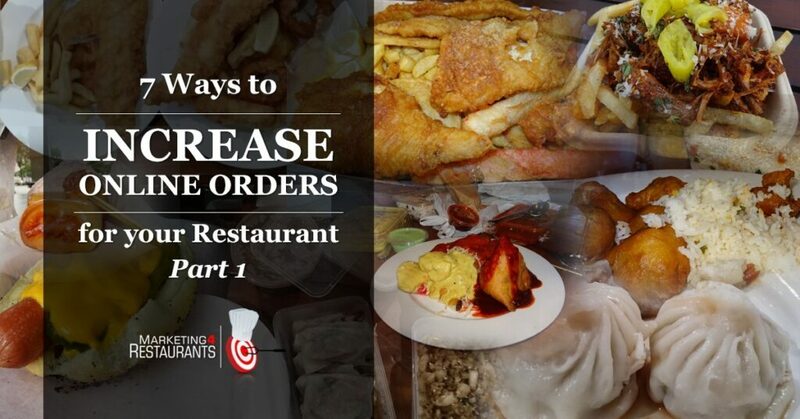 Are you running “Order direct from the Restaurant and save!” campaigns. These can be very effective for local restaurants. We discuss Giodano’s Pizza and their Deep Dish Pie and how it is almost the perfect product for Restaurant delivery. We talk about Sam Panopoulos and the international storm he created by throwing some pineapple on a pizza. In the next episode we will look at Domino’s Pizza and the economics underlying the way they cost their menu. If you are looking to increase your online orders, if you want an email database of your customers who order from you, try using the Free Restaurant OnLine Ordering system. It’s free, supports printing dockets, feeds into our Free Restaurant CRM system and processes payments in just 3 days. This is one of our most popular products with restaurants saving thousands of every month in commission. Not only do we have a platform for taking orders commission free, we have a process for building your online ordering business. Hey Everyone, Welcome back. First week in the office after returning from my trip to the NRA show in Chicago, which was epic. I spent a week in Taipei which is a great foodie city in Taiwan for Computex, which is a technology show. I went there to partially look at the technology. Also to have a look at Taiwanese cuisine. There’s a lot of really exciting things that’s going on there from a restaurant point of view. Very strong street vendor type scene and as you know, Michelin awarded their first one star to a Singaporean street food hawker kind of restaurant. Street food, I think, there’s so much that you can take out of it. Too many people look at it and just say, “That’s just street food.” I think there’s a lot to look at it from a process point of view from marketing point of view, from a product point of view. There’s a lot of things that’s really interesting on the street food scene. We’ll probably going to do a podcast around that. We’re going to also wrap up some of the technology that we saw at Computex. Computex is a general I.T. show. And I’ve been there in the past with my I.T. hat on. This time I was going there to have a look at some of the things from a restaurant point of view. The kind of things that are going to be new and going to be increasingly important for small restaurant owners just like you. We saw drones across, they’re going to be making the big becoming increasingly important from a delivery point of view, POS (Point of Sale) systems–just like in Chicago, there were 101 POS systems–3D printing using sugar, chocolate (people are printing with some fairly interesting things that I think that there’s a lot of work there that’s being done). It’s just really waiting for someone with a little bit of innovation, a little bit of creativity to start to really start getting them a lot of public relations. As they achieve that first move for advantage with the 3D printing type area. Virtual reality (VR), that’s coming a long, long way and it’s moving really quite rapidly and I’m looking to talk to restaurants about what they’re doing from a virtual reality point of view and augmented reality because I think that it’s a very interesting space. Particularly when you look at it from the multi-sensory dining point of view about what it is that you can do with virtual reality. How you can create an experience that’s worth so much more for your guests than just the food that you’re preparing for them. Artificial intelligence (AI) and big data, that was a really big part of the show as well. And I think, this is really exciting and it’s really important for us at Marketing 4 Restaurants because this what we’re really trying to do for small restaurants. Small restaurants, mom-and-pop-type restaurants, and small chains as well. Traditionally, [they] don’t have enough data to be able to get the kind of insights of a restaurant chain like McDonald’s or Domino’s are able to. They’ll have millions of data points that they can go trolling through. What kind of customers like this? Or, why do customers buy that? What we’re doing at Marketing 4 Restaurants, of course, is aggregating all of the data we get. And we would probably have closed to 10 million data points now at our database from restaurant marketing and online orders and restaurant bookings. And then, we run queries over so that we can tell our customers what’s working and what isn’t in restaurant marketing. So, there was a lot of insight there. We’ll do a podcast around the food that we got in Taipei and some of the things that we saw. I think that would be interesting as well, but today we’re here to talk about take-out. Take-out is becomingly an increasingly important part of our customers revenue. As we get more and more customers who are using the Free Restaurant OnLine Ordering system (FROLO). We spend a lot more time really trying to understand online ordering because it’s a very, very interesting space. A lot of small independent restaurants aren’t served well by their online ordering providers. We’re talking here, people, like Menulog, Grub Hub, Eat Now, Just Eat, Delivery Hero, Food Panda. Because those guys have business to consumers and they’re sort of like trying to sit in between you charging commission steal the email addresses and all of that sort of stuff. It’s very interesting when you start to think about online ordering as a revenue stream within the restaurant because there’s something that you’re going to want to do that you can’t actually do now. Why do restaurants do take-out? Now, we’re going start up with really simple question, “Why do restaurants do take-out?” And I think there are two very important reasons why you want to be thinking about take out. Firstly, it breaks the bottleneck of tables to revenue. If you have, let’s just say, 100 seats in your restaurant and you’re only going to turn them once. So, you offer a long degustation menu. You’re only going to turn the restaurant tables once. If you charge a maximum of $100 for arguments’ sake. The most money that you can ever make in a night is $10,000, that is every table, every seat paid for. So, if you’ve got no-shows, you got issues with that. Did you pre-pay? All of those sort of things. But, realistically, there’s not a whole heap of variability in there. Take-out breaks the linkage between the number of tables. You’ve got the number of times you turn those tables and you might turn them twice. If it’s twice, then there’s only so many that you can do. There’s only so much as how many plates that you got. How often do they get cleaned? There’s only so many from front of house team. There’s a whole heap of issues. You have a bottleneck which is the number of tables that you’ve got. Online ordering breaks that. What it does then is it moves that by breaking that linkage. You now can cook as much food as the kitchen can prepare. So, you’re moving the bottleneck from front of house into back of house which is more efficient because you might be able to process X amount through front of house through the tables if you have spare capacity in the kitchen. Then you can do Y amount of extra revenue. That revenue is more important to you because it’s not a part of your lease. Your lease should be split up, realistically, by the number of tables that you got. It’s only the kitchen that should be paying lease, when you think about it, you’re accounting for it on take-out and pick-up orders. Now, the profitability of your online ordering–that’s really driven by things by the fact that there’s very little front of house work that needs to be done. There is, you’re not going to be cleaning tablecloths. You’re not going to have any of those closely associated with table or the service required for the table. So, a take-out order is often higher profit than the same volume coming through from the table, so it’s quite high margin. And in the old days, people used to do a 10% discount for take-outs to drive a little bit more of the orders that weren’t going to be sit in, eat in. That’s the first reason that the person does it [take-out]. Now, the second reason that people do it and probably the more important reason. What problem do you solve in your restaurant? Let’s just picture the process. For me, on a Friday night, to go out to a restaurant, I need to think about a babysitter. Do I need to have an argument with my beautiful wife Tina about who’s going to be the designated driver? Because I might like to have two or three beers. It’s been a big week, I’ve worked very hard. She works very hard as well. Between the two of us, who do we agree on is going deserve more to have a drink or couple of drinks of red with their meal and who is going to be the designated driver? That’s one of the problems. Do we need to organize a babysitter? Yes or no? Are we going to be taking the kids? Are the kids going to behave themselves? Are we going to have conversations with the kids about why you are on your iPad or why aren’t you on your iPad? Why you’ve been loud and running around? What are the kind of air our kids have? Are they usually behaved when they go to restaurants? You know the kind of thing that I’m talking about here. We often, in fact, I can’t think of the last time that we cooked food on a Friday night. Because Friday night it’s the end of the week unless, of course we work on a weekend which of course, I often do. But it’s the end of the week, it’s the end of the traditional workweek for most people. We look forward to the Friday night and we will then order some food in. And, really, the only discussion is: Is it going to be Chinese, Thai, or Indian? And I always push for Indian because that’s my favorite cuisine. The product that you are shipping then is convenience and the ability to. Tina and I will have a bottle of red between us, plus or minus pre-drinks, usually not too many. We don’t want to go berserk. And, so, we wouldn’t be able to drive home if we did that. The kids will share in it and then they will either watch something called together as family or the kids will bum and burst upstairs to watch their own Netflix. That is the product that we purchase and, interestingly enough, I say that we do that every Friday. This is a habit for us. Friday night is a take-out night and usually it is delivery. Sunday night is our secondary take-out night if we have it and we don’t do it. Every Sunday night, which is usually every second or third Sunday night, more likely do we order fish and chips, more likely I go out and pick it up. So, take-out: one, it’s more profitable or online orders are, in general, more profitable. And, two, you’re providing a different product. Going out is not on the cards. If I had the choice of going out or not going out on a Friday night. I would probably cook something up and it would be a scratch to nothing overly exciting because I just want to sit down and relax and literally Netflix-and-chill. The food, obviously, is an important part of that. And by getting a really hot vindaloo. I can enjoy. I can eat the food that I like. I can drink the wine that I want with it and I can relax knowing that the nights taken care for me. So, it sounds pretty good and it sound exciting. Everything should be online ordering. What are the problems with that? Why does everyone do it? What are the issues that restaurants have in an online ordering type of environment? The first thing is logistics. From the kitchen point of view. Logistics, normally, is the synchronization of meals. So, you got four people who ordered four different mains. And you want those orders to come out at exactly the same time or as close to and they’re all going to be closed to just coming out to the kitchen as possible. So, nothing’s going to be sitting there for 15 minutes. Now, the head chef that’s his job, to perform that ballet. That ballet just got a whole lot more complicated because now you’re relying on a delivery driver. Interesting. And then the delivery driver is going to take the food that you have spent all that time getting the right produce, sourcing the right produce, procuring it, warehousing it, then processing it for just in time type. Process then it goes out to a delivery driver, who knows what he’s going to be doing with that. First thing is that you got the logistics issue about the timing. The second thing is, packaging. The packaging is absolutely critical when it comes to delivery, and in some respects, pick up. Because, don’t forget when we’re doing pick up then I’m doing the delivery myself. That’s the process that I’m going to do. The food that you have put all of that love, care and attention into is then going to be unwrapped, unpacked by me or delivered by the delivery driver. What is that food going to look like? How is it going to handle that transit? And that’s a really big question that far too many people don’t spend enough time thinking about which means that the experience of the customers at the end of it, is often not as good as it could be. Obviously there are people like Foodora, Deliveroo and UberEATS who take away logistics issue. You don’t have to worry that the delivery driver not being available and you don’t have to worry about scaling delivery drivers. Because they answer that part of the problem for you. Of course, it depends on the kind of experience that you have with your preferred delivery driver and the other thing that’s quite good about that. That these guys provide a marketing channel for you. They will do the marketing of your restaurant on your behalf. The big issue with this is: 1.) They charge 35%, and 2. ), You don’t get the customers’ email addresses. If you don’t get the customers email addresses then they’re not really your customer, you can’t remarket to them. You can’t target them again unless you’re going to do some things a little bit out of the box include a coupon in the bag, include a flyer. Get them to order directly. That is still going to leave you with the logistic problem. We’re going to delve a little more into this logistics problem because I think it’s absolutely fundamental to the operation, revenue and profitability of so many restaurants out there. Before we get into that, though, we’ll talk about some interesting numbers. The first one is the average take-out order, which is $48. This is done over a whole heap of orders that we have done on behalf of our customers using FROLO. It’s a little bit off because I haven’t adjusted for currency differences. So, we’ve got our US customers, New Zealand customers, we got a few other countries in there as well. It’s a little bit off, but in general I think you’re pretty safe with that. One of the things that we’re looking to do is to actually breakdown the differences by cuisine. I think that would be really interesting to know. Anecdotally, thin cuisines like Thai tend to have lower average order value than cuisines like Indian. I’m not sure why that is. One of the things that we do when we order Indian, we will order way too much for one meal. We will often have Indian as a meal sort of midweek so, it sits in the fridge for like four or five days. What happens to a buttered chicken or chicken vindaloo when it sits in the fridge for four or five days? It just sits there and gets better, doesn’t it? Thai, maybe not so much, maybe that’s one of the reasons that Thai is less likely to be one of those cuisines that has a higher average value for transaction. The next interesting figure is, the one that I find absolutely fascinating, the spread between the number of orders that the restaurant takes. So, some restaurants, regardless of the system, you know we talked to restaurants about, that are using adjusted or Menulog about order volumes and some they will say we get one a week. Others are doing north of $2,000 a week in orders. There are some really, really big differences here. I mean, if you compare a restaurant that’s doing $2,000 a week in take-out, they’re looking at doing an extra $100,000 in revenue for the restaurant. For a small moment, pop-up restaurants that would have to be, I think, the difference between being break-even to profitable as opposed to unprofitable, if not very unprofitable. And these are one of the reasons why I think so many restaurants are churned so often is that: People aren’t able to get the profitability there. Online ordering is a really easy way of being able to do that. You can see that, just for the order volume that some people are getting. And you think, “Wow, these guys are running really successful restaurants.” You can see that based on the number of orders that they’ve got coming through. So already, we’ve got a couple of things that you want to starting to think about. Are you going to do pick-up only? And the interesting thing about pick-up, finally, is that it means that you don’t have to have delivery drivers.You don’t have to worry about that entire logistics part. How do you then start to build a pick-up only business? We’re starting to see delivery-only businesses we’re saying we’re working with a restaurant that is delivery-only. Straight up, delivery-only. No store front, no dine-in, no pick-up. Delivery only. You get some significant benefits from that. You’ve got a business only focused on the kitchen, that’s the one thing. So, what they’ve been able to do is to have a very competitive price. Source really, really good ingredients. Work with chefs. So, people who are actually got strong talents in the kitchen, not 16-year-olds cooking pizza which is what a lot of large chains do. So they’re able to produce a great product. And they’re very clear. They segmented their market like a laser. They want people who want their pizza to be delivered to them. So, this is an interesting thing and I think this is the great thing about restaurants, in general. Online ordering in particular, there are a lot of ways that you can skin this cat. You’ve got people who are doing pick-up only. You’ve people who are doing delivery only and then you got people doing combination of both. You got restaurants who are doing their own deliveries and you’ve got restaurants who are relying on UberEATS to do it. Lots of ways you can work this. The next thing that you want to start thinking about what is the product that you are going to offer through online ordering. When someone signs up for Free Restaurant OnLine Ordering system (FROLO), some people will enter the menu for them and the thing that’s absolutely amazing is that 9 times out of 10, the take-out menu is exactly the same as the dine-in menu. From my point of view, I see a couple of problems with that. Firstly, you’re working off a menu that is dine-in. Often, there’s been no menu engineering whatsoever in the menu. I can’t stress this enough, you need to engineer your menu. What are the things that a high margin and how do you signify that to your customers so that they are more likely to order your high-margin products. You don’t want to get an online order for $100 of a product that you’re shipping at marginal value. You want to have at least some items in there that you’re making really, really good money on. Too many people that cost their menus, too many people don’t think about their menus, too many people have a menu that’s got 120 items on it. Now, you want, of course, 120 items and most of the time. When I see a menu with 120 items on all of these is a list of items. There’s very little drawing to what you want to have. Do you want one of the pizzas? Or this is the item that you want to have because it looks awesome at the picture? Wow. You want to order this, don’t you? No, it’s just like, “Come and eat at our restaurants. We got a whole heap of crazy crap on the menu. Pick one, it doesn’t really matter to us. We don’t even know what we make on individual items.” That’s not a recipe for success. The first thing is, engineer your menu. Cost it out. Start working out which one of them are the cash cows, which are the stars, and which of the dogs that you should be getting rid of. That’s the first thing. The second question is: How well is that item going to travel? I always find this really interesting because my family likes to order in. And I’m just thinking, “You know what, they’re going be going, ‘Oh, God why did he order that? It’s just going to look awful when it gets there.’” You see it, time and time and time again. I’ve seen it. There was a place that delivered a steak once and it came in a styrofoam box. A steak by itself and nothing says that you’ve made a mistake in ordering something than getting a steak in a styrofoam box. That’s just madness. How are you going to deliver that steak? How are you going make it to look appealing? What is it going to travel like? How long is it going to be in a car for? What temperature is it going to be there when it gets to the customer? How can you make that? What is the packaging that you are going have to able to enable it to travel well? So when it gets to me and I go, “Ah wow! Look at this, this looks tasty and exciting.” As opposed to: “Oh, God, what a mess this is.” Customers are concerned about this. I saw on someone’s Facebook. It looks like, “Oh wow. This looks like it was delivered via a roller coaster.” You know the restaurants did the right thing. You know, really sorry it wasn’t delivered by a super hero team. We’ll get in contact with you and sort it out for you. These are the kind of things that you want but what is it that you can do from a packaging point of view, that means that your food is going to get there in a better way. And so, from an Indian food point of view, I know some of the local Indian restaurants’ they’ll just have them in the normal little boxes that you get, ok that’s fine, that’s one thing. The one that we use at the moment which we use them predominantly because they do an awesome vindaloo. They actually wrap it in Glad wrap. That gets around time and time and time again, we’ve taken the boxes out at the bag there’s either Vindaloo or buttered chicken everywhere because it hasn’t been sealed tightly. What are the little things that you can do to make that work a lot better for your customers? Do you have online ordering-only specials? This is one of those things if you’re wanting to increase your online ordering numbers. Do you have an online-only offer? You think about it, when you are marketing you want drive people’s behaviors. And I think, the greatest example of this is: I was lucky enough to get some point upgrades with Qantas when I was flying bound to Chicago and to Taipei. So, Qantas has a really tough job. They’re meant to be providing business class grade A food in virtually no kitchen. Look it’s just a little tiny galley and they’re doing that in 30,000 feet. They have limited staff, limited equipment, and limited time to be able to do that. It’s all very complicated and messy. One of the things that they don’t want to do is to disappoint any of their passengers by saying, “I’m sorry, we don’t have that available.” What they want to do is drive people to order their meal online before they get on the plane. That way, they’ve got a much better idea of how many meals they’re going to need. Don’t forget, once they’re out of something, they’re out of something. They can’t just go down the street and get a couple more steaks. They want people to order online. The trick that they used to do that is they have online-only items that you can order. And usually, they’re pretty towards the top of the pack, from my point of view. This is one of the ways that they can increase the percentage of people who are ordering online which decreases the amount of wastage that they have. If you think about it, they don’t want to disappoint their passengers. They a have a certain number that they’ll have. Do they take extras or do they know that they’re going to have a certain number of passengers who are going to be disappointed because they didn’t guess right as to who was going to order the chicken as opposed to the beef? One of the big dramas that they got. This is one great way to increase online orders. So, an online-only special which means that they then are able to increase the number of customers who are pre-ordering, which means that they’ve got much better idea of the number of meals they’re going to need. And the types of meals that they’re going need on each flight. On Facebook, you say, “Order online for our special. This week it going to be this.” This is a great way of testing and adjusting what it is that your customers wants. Because, don’t forget, you may have different customers. You may have customers who only order online. You may have customers who only order dine-in. How do you play with that? How do you try and get the maximum benefit from that? This is one of the things that you can do to increase online orders. Now, the next thing is the packaging. So I already talked about when we get food whether it’s Chinese, Thai, or Indian. Generally, it comes in a white plastic bag. What is it that you can do and you’ll notice: Uber they put a little bit more effort in there. hey’re trying to build a brand so of course it’s got “UberEATS” on it. This is one of the things that’s a little bit of a problem. We want to be building your brand, not somebody else’s. So, would it be worthwhile getting some paper bags printed up with that information in it. I find it really interesting, but one of the old-fashioned marketing things that used to happen all the time was that you would get the menu in the bag. Now, you can do that. That’s one of the things that you can do. And, I think, it’s a good idea to do that, particularly if you’ve got people who are more comfortable placing the order on the phone. You can say, I don’t want the phone ringing all the time with orders because we’re busy. Well, would you prefer to get the order or would you prefer to them to bring someone else with their order? I think that there is still a large proportion of people who would prefer to place their orders via phone. Have you thought about that? The other thing that you could be doing is putting in an offer. Use this coupon in the month of July and we’ll give you ___. Are we going to do a discount? Are we going value add? Is it going to be a free bottle of this? Is it going to be a free entree? A free appetizer? What is it that you want to put in there as a way of ensuring that the customer will come? You got to remember, the mathematics of restaurant profitability are pretty simple. It’s the number of customers you’ve got, the number of times that they purchased from you, the amount that they purchase and your profit margin. Just go thinking, we talked about this in the levers of profitability podcast. This is one of the reasons that you can give them to order. Get a short run of coupons done. Hand them out to your dine-in customers as they leave. We hope you had a good meal, we’d like to offer you this for online ordering. One of the things that we’re seeing worked really successfully is customers who are using Just Eat or Menulog, they will slip one of the coupons in there and if they’re using Free Restaurant OnLine Ordering system (FROLO), they order direct from the restaurants and save. They have an offer in there as well. They are one of the things that can do quite well to help drive customer retention. And of course, if they order from FROLO, then you will get the email address. Then we’ve talked about the product that you’re going to ship. What is it that the customer want? What is your online ordering menu made up of? How can you package when the package is edible? And obviously, when it’s shipped, that’s going to go in a box as well. But that’s going to travel a whole lot better than your generic pizza. That’s going to have, the box gets squash, then you lift up the lid and the lid’s covered in pizza toppings. That wouldn’t happen with this. The top might be a little bit crushed, but that’s fine. It’s still, going to be really good condition as supposed to an open-faced pizza. Thinking about that, there’s probably a lot more. It makes you think that pie would be the perfect delivery business now. No one is really doing that, I don’t think. Yes, what else is there that you can do? Now, one of the things that I want to do is to transition to have a bit of discussion about some of the things that Domino’s pizza does. So, they actually cook food, and they deliver and get people to take out. I think it’s really instructive and, of course, they do it on a very successful and a very large-scale. We can argue about the quality of the food, but at the end of the day, they’re very successful with what they do. So, I think it’s really worthwhile having a bit of discussion about what it is that they do. But before we get into that. I want to talk about a little bit of sad news. That is, that Sam Panopoulos passed away. Not you may not have heard of Sam Panopoulos but his passing is worthwhile talking about. Partially, he was a little bit of an inventor, quite creative. Now, the really interesting thing about his most famous creation was that the President of Iceland , Guðni Jóhannesson, actually called for a ban on it. He was a Canadian citizen, who caused Justine Trudeau, the Canadian Prime Minister to come out in defense of his creation. And if you haven’t worked it out, it was the Hawaiian pizza. So, putting pineapple on a ham pizza–he was evidently the guy who created that. And, so, it was that innovative, trial-and-error kind of story. When someone has gone out and thought, “I wonder what pineapple would taste like on a pizza?” And he created the Hawaiian pizza, which is one of the most famous pizzas in the world. Obviously, not that popular in Iceland. However, Justin Trudeau is quite a big fan of it. Sadly, he passed away this week but I think it’s important to give a nod. I know, in our family, three quarters of the people –their favorite pizza is the Hawaiian pizza. Just it goes to show, that was done a long time ago, over 50 years ago. Initially, it wasn’t that popular but as people sort of warmed up to the idea of pineapple on a pizza, it became increasingly popular. And as we know, has spread around the world. So, an interesting thing and I think you’ve got your traditional Italian pizza, the Hawaiian pizza is the way this has morphed to adapt to people’s changes and taste preferences. So I’ll end the podcast there. The second part will come out next week and we’re going to really delve into the mathematics of Domino’s pizza ordering. Why did they do that? And then, how can you do it in your restaurant? I think that’s really the important part. It’s going to enable you to dramatically increase the profitability of your restaurant particularly when you have to think about the mathematics that sit down behind it. And what is it that they do? And how they do it? So, stay tuned for that one and apart from that I hope you’ll have a really busy day. Bye.